Editions : There is only one edition of the DS9 TM. 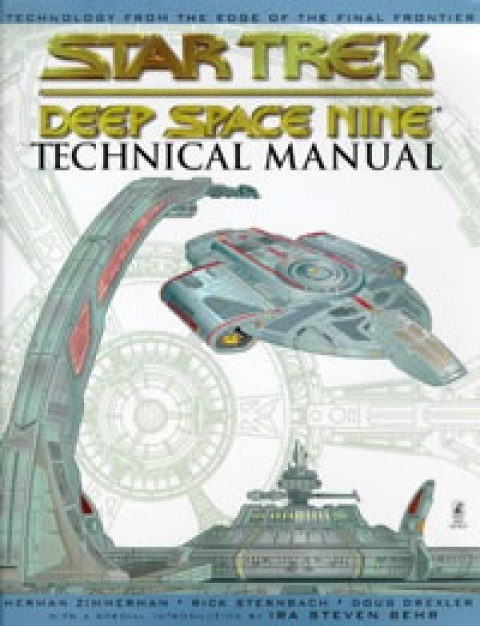 The Deep Space Nine book is the final in the series of three Tech Manuals produced for Trek. Although the station occupies centre stage, like the Franz Joseph book the DS9 TM takes a look beyond the station itself, detailing the Danube class Runabouts, the Defiant, and taking a brief look at some of the major ships in use by other powers. The book has glossy paper and is filled with many full colour illustrations. Most are 3D effect renderings rather than the orthographic views of the TOS and TNG manuals. While these look nicer, personally they aren't my preference. At the rear of the book are several fold-out sections which give large views of the station and deck plans for the Defiant. Unfortunately, the book is somewhat more flawed than its predecessors. Some of the flaws are the inevitable contradictions which creep in when the writers choose to go their own way rather than stick to the manual - the kind of problem that has rendered significant chunks of the TNG TM out of date. More unfortunate, some of the TNG TM's flaws have been carried over to the DS9 manual. Probably the most dissapointing section is that detailing non-Federation ships. The section is rife with errors; in at least one case a set of specifications seems to have been copied directly from one ship to another completely different one, so that both are claimed to have identical dimensions, armament, etc. I've heard it said that the DS9 TM was produced in something of a hurry, and the writers simply didn't have the time to do the kind of job they wanted. I can certainly believe that.